Haiti’s long-planned Oasis hotel is slated to receive a $7.5 million financial boost and has set a November 2011 opening date. PORT-AU-PRINCE — It was supposed to be an oasis in an investment-hungry nation riding a wave of improved security and optimism: a 60-room South Beach-inspired hotel offering upscale shops, a 300-car garage and a helipad. Then the catastrophic Jan. 12 earthquake hit, wiping out $6.4 million in investments as investors lay dead, and others stood in financial ruin. Almost six months after the disaster, the Oasis hotel project is on its way back with more than double the rooms. The International Finance Corporation, a member of the World Bank Group, is providing $7.5 million in low-interest financing to developers to help restart construction as early as next week. “It’s one thing to say Haiti is now open for business, but how open can we be when we don’t even have hotel rooms to lodge potential investors?” said Jerry Tardieu, chief executive officer of SCIOP S.A., the Haitian company developing the mixed-use hotel complex. With a planned November 2011 opening date, it’s expected to be Haiti’s first newly built post-quake hotel. In less than a minute, the earthquake left a government-estimated 300,000 dead, and wiped out 848 of Port-au-Prince’s 1,621 hotel rooms, including the country’s most well-known, and prized brand, Hotel Montana. 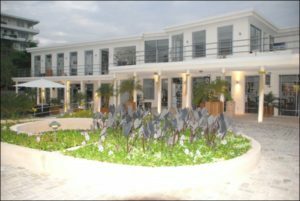 Already under construction in Petionville, the Oasis’ hotel building survived, but the restaurant, used to generate revenue to help support the complex’s construction, was badly damaged. Henrik Pedersen, IFC tourism sector head, said Oasis’ survival of the 7.0-magnitude quake and its ability to create jobs in a shattered economy were among the things that made the project appealing. “We understand there are very few safe hotel rooms left and this will be a critical part of getting business back to Haiti and improving the business infrastructure,” he said. Pedersen said the IFC plans to also look at how it can assist other hotel owners in rebuilding in support of Haiti’s reconstruction efforts. “We consider tourism and hotels an essential part of a country’s business infrastructure,” he said about the IFC, which has more than 230 hotel projects active in more than 60 countries across the globe. Tardieu said plans to create office space were scrapped to increase the rooms from 60 to 132. The IFC also will provide technical assistance. “There is a void in the market to fill and this is a unique investment opportunity,” said Tardieu, whose investors range from school teachers to doctors to business moguls, all Haitian. Since the devastation, the international community has pledged more than $5 billion for rebuilding over the next two years, but donors have been slow to fulfill their pledges. “This is the first direct signal of the confidence the international community is having in Haiti and tourism remains one of the sectors of economic development of the country,” said Tourism Minister Patrick Delatour, an architect who is helping to lead reconstruction efforts. Still, Haiti has its challenges. Local hotel owners, like many owners of the businesses destroyed in the quake, are struggling to find financing while haggling with banks and insurance companies. This week, the U.S. Embassy revised its travel warning for U.S. citizens, urging them to avoid travel to Haiti, saying that in recent months at least two U.S. citizens visiting relatives have been shot and killed after leaving Port-au-Prince’s airport. Since 2006, the IFC has provided $68.6 million to eight private sector projects in Haiti. Earlier this year, it also assisted the Haitian government in a $99 million public-private sector deal with Vietnam’s largest mobile telephone operator, Viettel. Viettel will retain a 60 percent stake in state-owned Télécommunications d’Haiti (TELECO). The Oasis is built fronting on a gas station with a bunch of people sitting on the street. The owners must have owned the property, from the past, because no one would build something like this with frontage on something only slightly better than a slum. The entrance to their underground parking would frighten a wild American off-road enthusiast as the ramp plunges into a caver with very narrow, hard to get into spaces. The rest of the design mirrors the parking garage. The property was originally a small restaurant, which remains as a part of the hotel project. The location is not one that would allow a good presentation, as was enjoyed by the Montana before the earthquake destroyed it. It is on top of a very busy, noisy, smell street. Lots of local colour but not the location for a luxury hotel. But there are no hotels left in the Area so it will succeed.